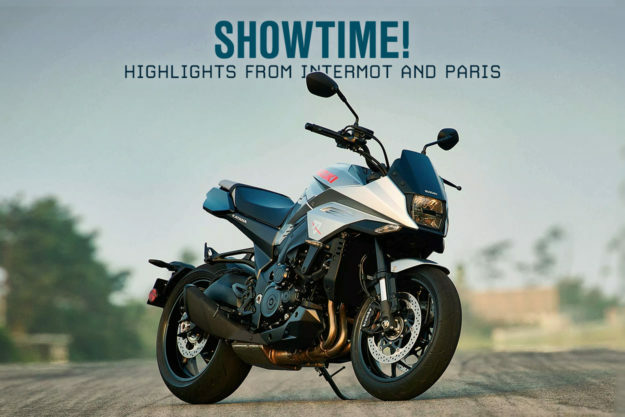 The Intermot show is over for another two years. It’s been an action-packed five days, with Indian making perhaps the biggest bang with its FTR 1200 street tracker (see report). But ‘America’s First Motorcycle Company’ didn’t have a monopoly on the news. We’ve picked out four more important launches—plus a couple of leftfield machines that have just debuted at the Paris Motor Show. 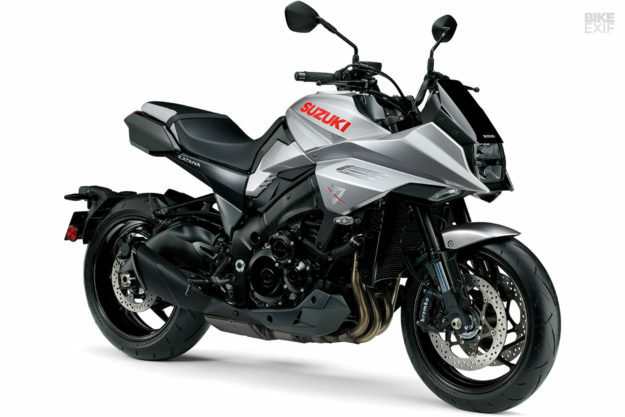 Let’s kick off with the one that created the biggest buzz: the new Suzuki Katana. 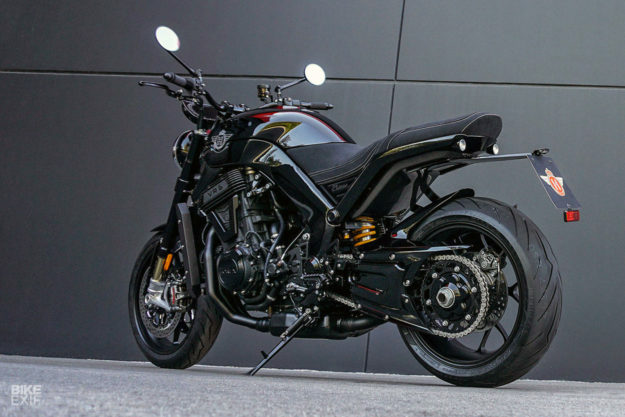 The new Suzuki Katana The rumors have been floating around for years, and Suzuki has finally confirmed that the Katana is back. The new bike will go on sale in just over a year’s time, and it’s based on the GSX-S1000. We reckon Suzuki has got its strategy right. This won’t be a class-leading hyperbike costing the earth, but a large-ish roadster sold at a mid-range price. 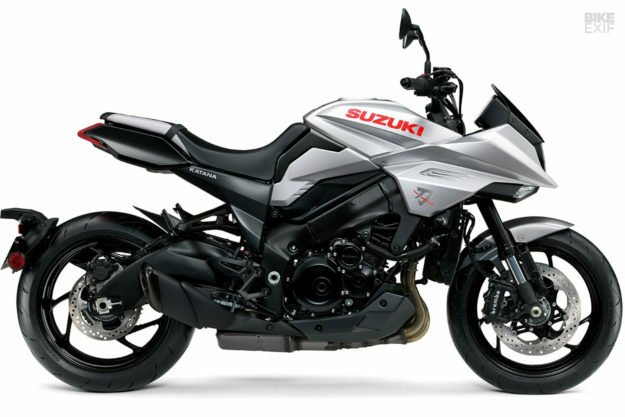 Suzuki has wisely taken a leaf out of BMW Motorrad’s playbook. Just as the Germans repurposed an older Boxer engine for the hugely successful R nineT, the Katana engine can trace its roots back to the 2005-2008 GSX-R1000. Key specs are 110kW (150PS), around 80 pound-feet of torque, a curb weight of 474 pounds (215 kilos), brakes by Fujico and Brembo, 17-inch wheels, LED lighting, an 825 mm (32.5 in) seat height and 3-mode traction control. 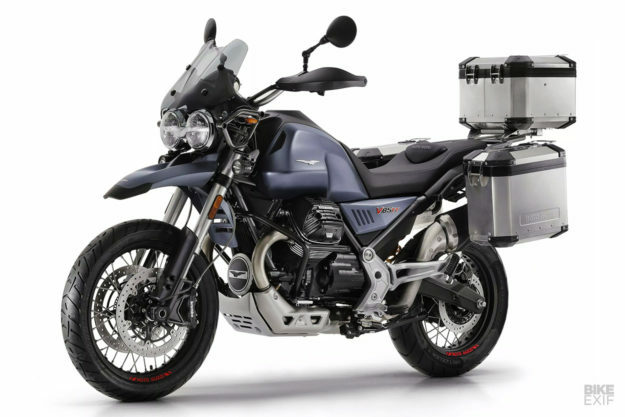 Moto Guzzi V85 TT Mandello del Lario has already teased us with shots of its new ‘classic enduro’ bike, but it was shown in the metal for the first time at INTERMOT. 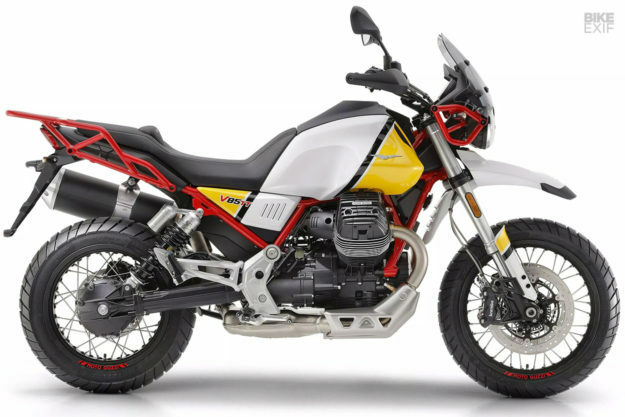 The ‘TT’ stands for Tutto Terreno—meaning ‘all terrain’—and the bike is a bridge between basic dual sports like the Kawasaki KLR650 and the techno juggernauts produced by BMW and KTM. The engine is new: an 850cc, air-cooled, transverse v-twin pumping out around 80 hp. But the styling takes cues from the old V65 and V75 Baja models, which ran in the Paris-Dakar. There’s traction control and ABS, three riding modes, a full-colour TFT dash and a Bluetooth multimedia system built in. So it’s fairly modern under the hood. We loved the multi-colored model shown in the original PR, and the steel blue/grey bike shown in this latest update looks good too. There’s no word on weight yet—a bit of a worry—but the steel tube frame (using the engine as a stressed member) is slender. 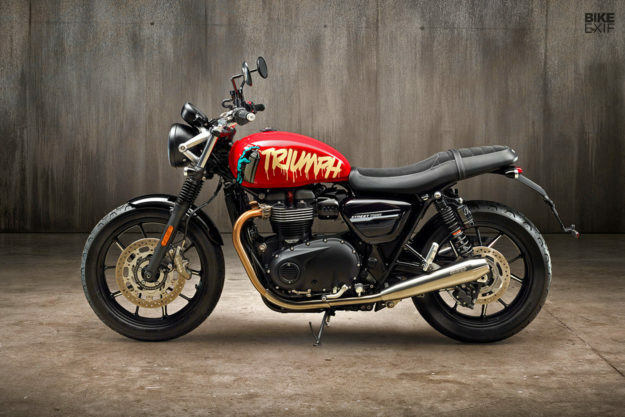 2019 Triumph Street Twin update The Street Twin is the biggest-selling bike in Triumph’s modern classics range, but that hasn’t stopped Hinckley from improving the recipe. Cosmetic changes are virtually invisible, but the 900 cc engine gets a very useful power boost from 54 to 64 hp and the redline is bumped up 500 to 7,500 rpm. 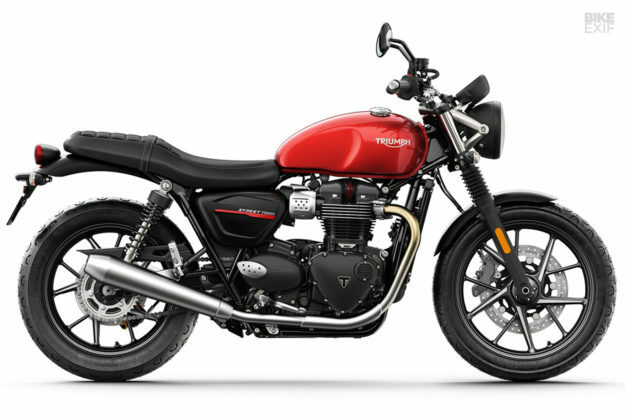 The two ride modes available on 1200 Triumphs—Road and Rain—have finally filtered down to the Street Twin, and there’s an updated dash. You also get new aluminum multi-spoke wheels and higher-spec cartridge forks, plus four-piston Brembo calipers for the front brakes. Peugeot relaunches in Europe In Europe, everyone knows Peugeot as a brand of scooters and mopeds as well as cars. But since 2015, 51% of the operation has been owned by the Mahindra Group, one of India’s largest vehicle manufacturers. Mahindra already owns the BSA and Jawa brands, and has just signalled Peugeot’s return to the motorcycle market after an absence of 70 years. Two urban-oriented 300cc machines were unveiled at the Paris Motor Show this week: the P2x Cafe Racer and the P2x Roadster (with the blue tank). 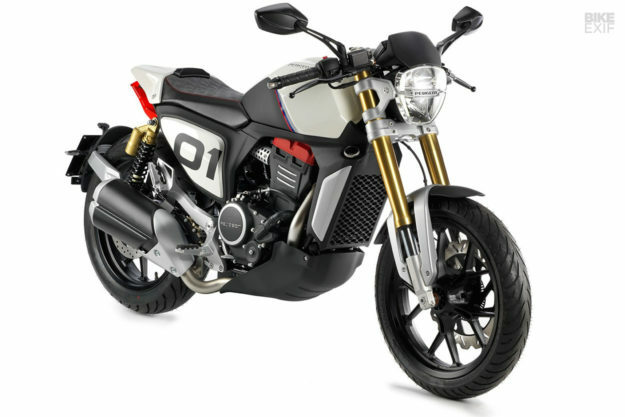 The two Peugeots are potential competitors to the smaller KTM Dukes, the BMW G310R, and the Honda CB300R. 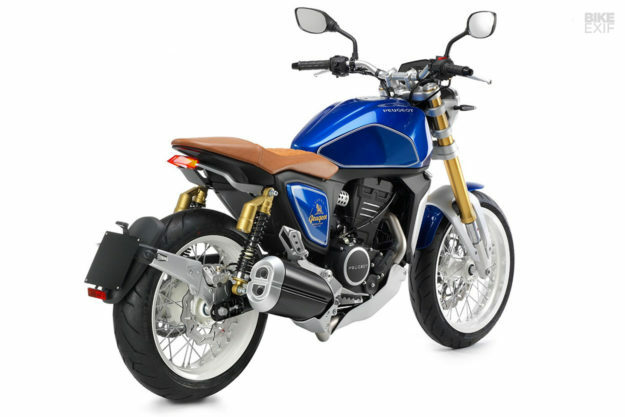 They’re aimed at the booming sub-400 cc European market, are slated to go on sale in 2020, and we reckon they’ll sell like gâteaux chauds. Horex VR6 Raw You could say that Horex is the European equivalent of Motus: an independent supplier of old-school grunt and style, prone to financial difficulties. 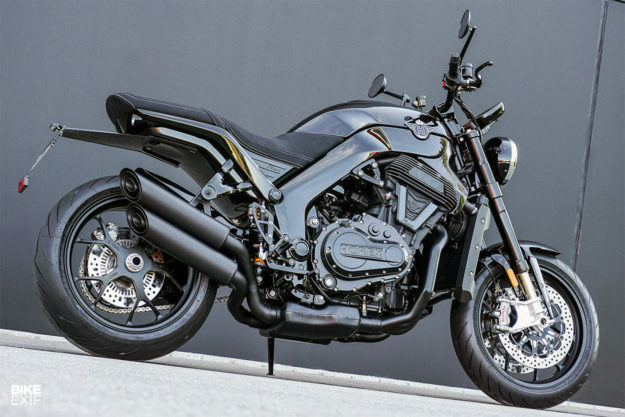 But unlike Motus, Horex is still a going concern, although the company filed for bankruptcy in 2014. With a new owner on board, production of the VR6 has restarted, and a new ‘Raw’ variant debuted at INTERMOT. Every component is finished in a shade of black, apart from the new (and super-bright) 7-inch LED instrument display. The unusual six-cylinder 1218 cc hand built engine remains, putting out 163 HP despite being only 43 centimeters (16.9 inches) wide. The rest of the componentry is top-notch, with top of the line gear from Öhlins, Brembo and Bosch—plus carbon everywhere, from the subframe to the fenders. 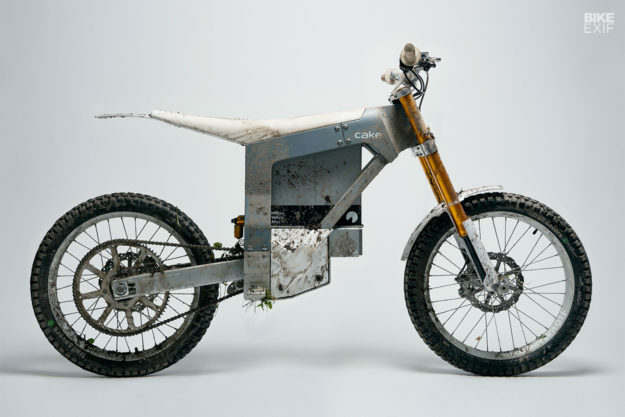 CAKE electric off-road motorcycle CAKE is a Swedish company that’s been bubbling under for a little while now, and it well and truly came to the boil in Paris. The full production version of the bike was on show—after a run of limited edition machines—and it walked off with the ‘Best of Best’ award in the Automotive Brand Contest. There are several good electric bikes on sale these days, so why is CAKE so significant? The striking design is a big part of it, because the Scandinavians have ditched the standard visual cues that most other electric makers adhere to. The specs are pretty impressive too: weight is a mere 69 kg (152 pounds) but power is 15 kW—equal to 20 hp. Couple that to gearing which maxes out at 75 kph (46 mph) and you are guaranteed rapid acceleration. Range is up to 80km, or two to three hours of riding, and a 1.5 hour charge will return the battery to 80% of capacity. 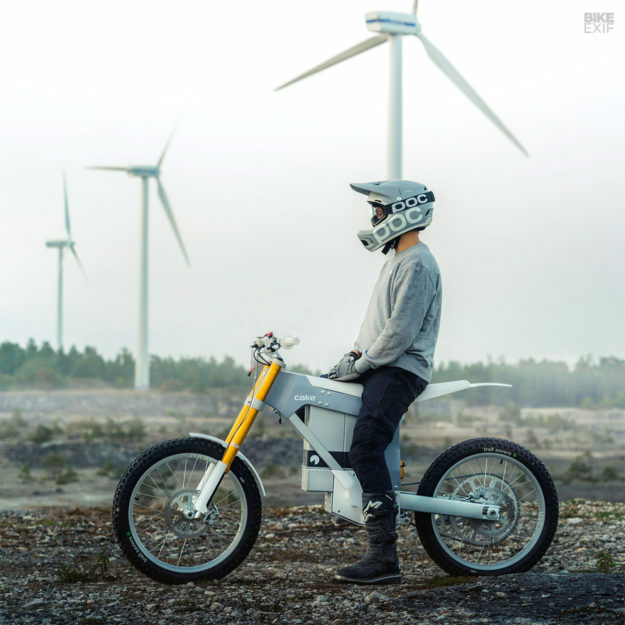 There are three riding modes, mostly to moderate battery usage, and the riding experience is reportedly amazing—thanks to custom suspension developed by Öhlins.